The home was built by N.A. Freeburg, a general contractor of Swedish descent, who built it for his bride, Esther, intending is to be their permanent home. However, within three years it was sold to G.A. Renden, a co-owner of the Mandan Roller Mill and one of the founders of N.D.U. 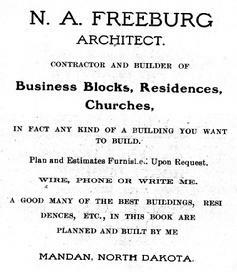 Freeburg and his partner Charles Kidd built several of the prominent structures in the community, including the H.R. Lyon home at 309 4th Avenue NW, and the First National Bank Building. 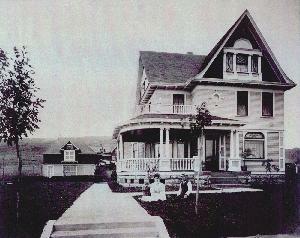 In 1940 the home was sold to H.A. Jones; in 1942 to Oren Baertsch, a bank examiner; and in 1949 to Bill Joersz, then owner of the Piggly Wiggly grocery store. In 1959, Maurice LaGrave, an attorney, purchased the home, followed, in 1967, by Gene and Nola Helm, owners of Helm Brothers Sand and Gravel. 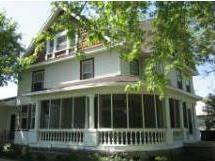 In 1990, the home was purchased by Chuck and Janet Esser of Camas, Washington. Janet�s ancestors, both maternal and paternal, had been immigrants to the Sims area a century before. The Helm family, intending to make it their permanent home, gave the home a major restoration. A room was added to the rear of the house, as well as a utility room and a garage. However, the original stairs, sliding doors, woodwork, pillars, full-wall bookshelves and windows were left intact, as well as the uniquely finished rock foundation. The carriage house is now a separate resident at the rear of the property. The home has a warmth and lightness that wraps itself around all those who enter and the front porch has always been a favorite gathering spot for friends and family.